“Graham was very responsive to our feedback throughout the logo design process, so it felt like a positive collaboration. 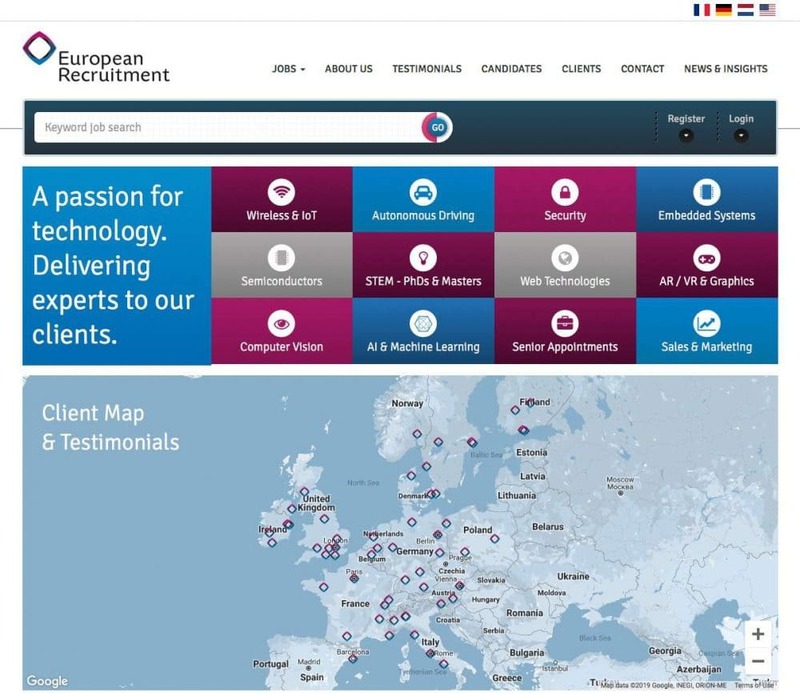 European Recruitment is an award-winning, international recruitment agency specialising in niche technologies. We provide intelligent recruitment solutions, championing quality over quantity, and offering permanent and contract opportunities throughout the UK, Europe, Asia, US and Canada. Additionally, our consultants combine research and recruitment to have a deep understanding of the technical areas in their respective industries. Since we’ve opened we have expanded rapidly and built relationships with some of the most successful technology companies in the world. Our focus is to provide you with the best service possible. So for employers, this means we provide the best candidates on the market to quickly and efficiently solve your recruitment needs. For job seekers, it means we find you a career move where you will be happy with your role, company, location, future opportunities and remuneration. Due to our excellent referrals from clients and candidates, we quickly became an approved member of the Association of Professional Staffing Companies (APSCo). APSCo is the UK’s leading professional recruitment industry body. Our accredited membership is also testament to the quality service we provide, and our commitment to excellence. European Recruitment was founded in 2009 by David Wicks. His previous company came 35th and 68th with the likes of Innocent Smoothies in the Sunday Times Virgin Fast Track 100 in 2007 and 2008. The company was also an established supplier to the European High-Tech & Finance market with £17 million turnover when he sold in September 2008.